A 40-year-old man presented with a recent history of a putative upper respiratory infection for which his internist had prescribed ampicillin. 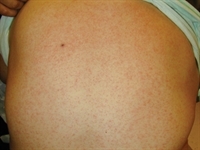 Four days after starting treatment, the man developed a rash, first on his back and then on his upper arms. The eruption did not itch, burn, or hurt. The patient did not have a fever. On basic laboratory testing, WBCs, liver function, and antinuclear antibodies were within normal limits. The patient was a 50-year-old man who noted fine blood vessels spreading over his chest but nowhere else on his body. The eruption was asymptomatic; scratching did not cause urtication. The patient had a history of hepatitis, but current liver function tests and a hepatitis screen were normal. He did not report GI upset. A colonoscopy was unremarkable. The patient had never had any abnormal reactions to sun exposure. Tests for carcinoid were negative.